The Brazilian port of Paranagua´ is claiming a new record for the export of soya. It believes this was achieved in April, when 1.476mt (million tonnes) were loaded onto vessels. This was 2% more than in March and 6% higher than April 2014. 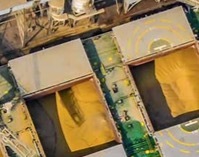 Port officials say that the record was established thanks to the arrival of two new shiploaders, which cost $18.6 million, but can load 33% more soya than previous equipment. Previously, shiploaders at the port could load at an hourly rate of 1,500tph (tonnes per hour); the new equipment will handle 2,000tph. In recently released statistics, Paranagua´ said it exported 2.8mt of soya in the first four months of the year, 1.5mt of bran and 871,000 tonnes of corn. Two additional shiploaders are expected to be put into operation by August.